How do I make a Gift Certificate Product? A Gift Certificate Product is an item that can be bought in your store for a specified dollar amount. During purchase, a special code is created on the store which acts as a credit on the store for the dollar amount/face value of the purchased gift certificate. During purchase, the shopper buying the gift certificate can either use the Gift Certificate code themselves at a later time, or have it sent to a friend for them to use on your store. Gift Certificates are non-taxable and sold for the specified amount. Discounts, promotions, customer pricing levels and coupons cannot be used to purchase them. The following article will illustrate how to set up a Gift Certificate Product on you store. If you are using Inventory Control for your store, be sure to set up a large number such as 999 for the item's "Stock" level. This way it doesn't appear as "out of stock" to your visitors. In the Pricing section of the product's Information Tab, specify the price that the gift certificate will be available for. Lastly, look to the right of the Pricing area and mark the "Gift Certificate" option box. Finish customizing your product with categories, descriptions, keywords, images and any other parameters you'd like to specify. Be sure to click "Save" on your product before leaving the Information Tab! By marking the item as a Gift Certificate, the item will automatically add a block to the product's listing page which will allow the shopper to include an email address, name and message to whoever they'd like to send the certificate to. As mentioned above, the value of the Gift Certificate is based upon the product's price information. Normally this would mean creating a gift certificate for each dollar amount that you'd like to have available. 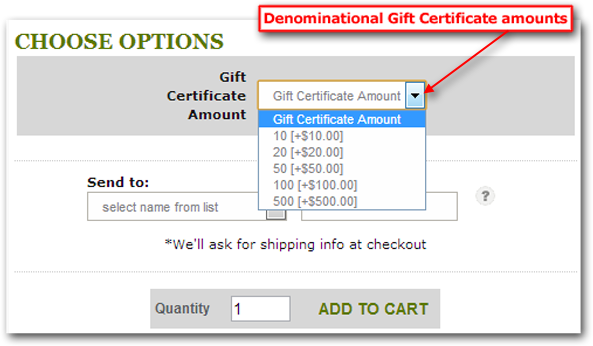 However, as an alternative, you can leave the Gift Certificate's price information as 0, and then create Options with Values to denote different denominations. To do this, follow the next steps. Add a new drop down or radio option and label it as needed. Your gift certificate will now be available for purchase with any of the allowed denominations. When a shopper purchases a gift certificate, they will be presented with a a form in which they can enter a To:, From:,and aPersonal Message. When the order is placed, an email is sent to their recipient along with the Gift Certificate Code that will be used to redeem the certificate cost. When a gift certificate is redeemed, the shopper will enter it in the store's coupon code field. 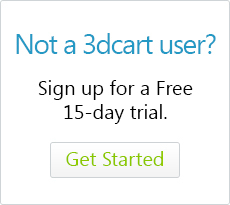 This can be done in either the View Cart Page or during the checkout process. The store will then place the Gift Certificate's amount towards their final purchase. If a balance is left over, their certificate will still be good until the remaining amount is used up on subsequent orders. For situations where the Gift Certificate covers the entire order, be sure that your store has a "No Payment Necessary" offline payment set up. Click here for more details. 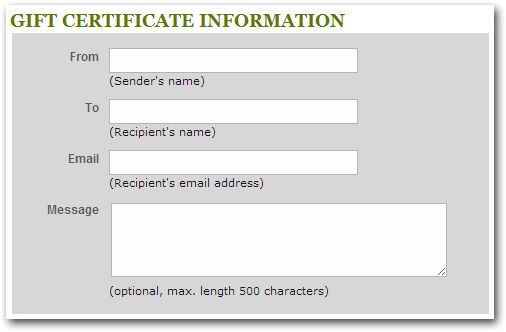 To view your site's list of Gift Certificates, go to Settings =>Payment =>Gift Certificates. This will show you a full list of your store's purchased gift certficiates, their respective codes and remaining balance(s). Clicking on "Edit" for any of the certificates will also show you orders on which they were used. You can also generate your own Gift Certificates from this same page on the fly when necessary. This can be useful as a way to provide a store credit (instead of a refund) for RMA or other customer service situations. More information can be found by clicking here. As a recommendation, it may be beneficial to set the COST of your gift certificates to be the same as its face value price. The reason for this is because the gift certificate will appear in your store's sales reporting when it is sold as well as when it is used. Remember that your sales reports will show data of items sold as well as payment collected on the store. A Gift Certificate technically falls under both designations. Therefore, by setting the Gift Certificate's COST to the same as its face value, you're preventing the store's sales and profit reporting from being unfairly skewed. In other words, let's say you sell a $100 gift certificate. If the gift certificate has no cost specified, your store's reporting will reflect that you sold and made a profit of $100 on that sale. Days, weeks, or months later, when the Gift Certificate is eventually used, your store will report it used as a collected payment. Reporting for that subsequent order will reflect that you sold $100 worth of items and collected $100 via a Gift Certificate. However, since the original Gift Certificate didn't have a cost specified to it, both combined orders (the order where the gift certificate was purchase and the order where the gift certificate was used) will report an inflated profit number. To avoid this, you would make the cost of the gift certificate reflect its overall face value. This way, when the certificate is initially sold, you are not making any profit on it yet. However, when the certificate is ultimately used, your profit reporting will reflect profit more effectively.